What if each student had her own teacher at school? Would she benefit from individual attention, progressing at her own pace, learning the way that best suited her? Clearly, it's economically and physically impossible to provide each student a separate teacher, but technology can be a powerful tool in helping that process along. In today's Wall St. Journal, writer Barbara Martinez discusses how teachers are using laptops a few hours a day in the classroom to help kids learn to read at their own pace. What they call the "blended learning" approach allows students at P.S. 100 in the Bronx to combine online learning with traditional teaching techniques -- with the educator taking the role of a facilitator -- and is proving to show great results. "The more motivated and interested they are, the better able they are to want to do their work," said Sarah Kougemitros, a fourth-grade teacher at the school. She notes that the programs are full-fledged curriculums that come with great ideas for captivating student interest. For instance, her students are now enjoying the topic of chocolate, which includes fiction and nonfiction reading and writing online, as well as geography about the origins and manufacturing of cocoa beans. Teachers can adjust the level of difficulty in reading groups: some kids can read on their own, while others have the books read to them as they follow along. For those who have difficulty reading, or have learning disabilities, this kind of individualized curriculum can engage them in the content without alienating them from the learning process. In a similar example, 93% of one fourth-grade math class that used a blended online program in Texas met or exceeded standards, compared to 66% who passed in a class that didn't use the program, the article says. The Department of Education certainly sees this as a valid innovation to pursue: they've allotted $30 million in the next three years to take this blended learning program to 400 schools, according to the article. The concept of blending an online learning environment with traditional teaching is growing in public schools. Across the country, an estimated 1 million elementary and high school students were engaged in online courses in 2007-08, up 47% from the year before, according to Anthony G. Picciano, a professor and executive officer of the Ph.D. program in urban education at the City University of New York. Educators are finding their own ways of making it work. Teacher Jill White uses different types of videos to teach the same lesson to her students. "I have the same video clip for bears on three computers. 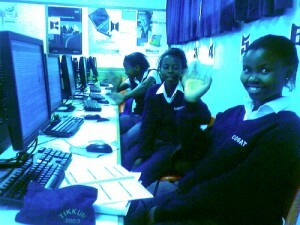 One computer will have an activity with creative writing, having the student pretend they are the bear on the video and writing about their adventure. The second computer will create a new undiscovered type of bear. The student will include a detailed picture and a description of the bear including feeding habits and their habitat. The third computer will have the student draw three different types of bears in the video with details including their habitat." Fourth-grade teacher Kevin Durden at Forest Lake Elementary School in South Carolina allows his students to use PowerPoint slide shows with videos, quizzes to test classmates, and comic strips to engage them in different ways. "When I was student teaching in a more traditional environment, I felt that out of a class of 20 students, I was actually teaching maybe 12 of them," he explains. "Now, with these new tools, I feel I'm teaching every single one of them." There are countless more similar innovations happening across the country. Are there any downsides to this? I haven't found any yet, but I'll be looking into it, and would like to hear from educators or parents who have any personal experience or thoughts on the matter.